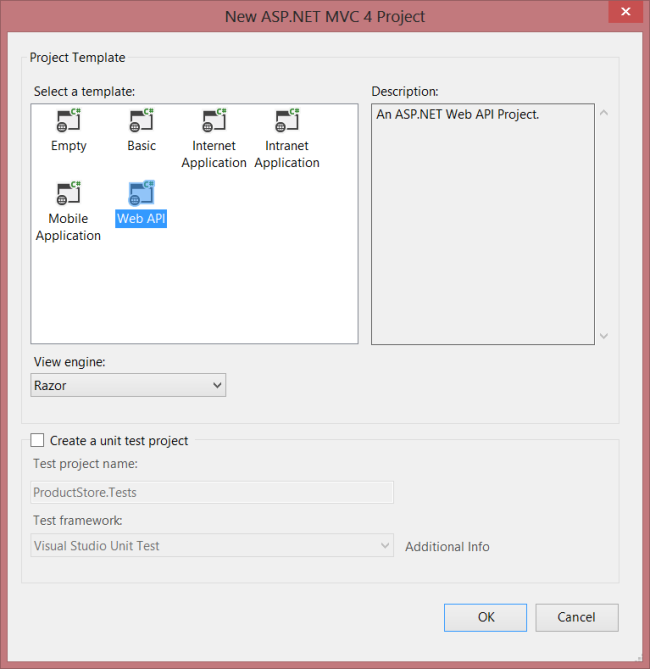 This tutorial shows how to support CRUD operations in an HTTP service using ASP.NET Web API for ASP.NET 4.x. CRUD stands for "Create, Read, Update, and Delete," which are the four basic database operations. Many HTTP services also model CRUD operations through REST or REST-like APIs. 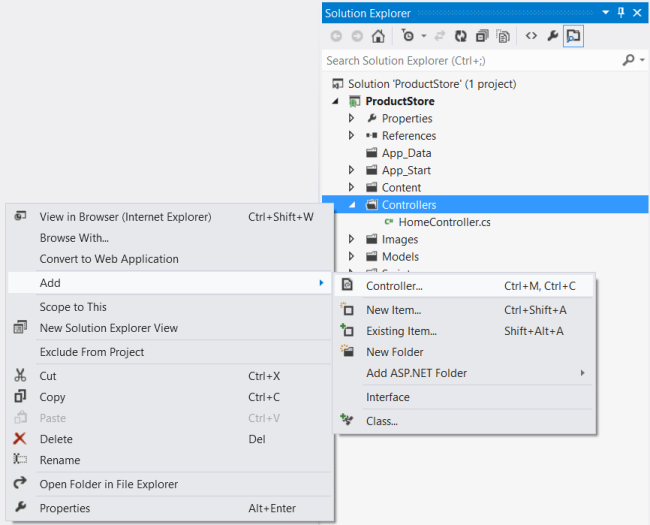 In this tutorial, you will build a very simple web API to manage a list of products. Each product will contain a name, price, and category (such as "toys" or "hardware"), plus a product ID. The products API will expose following methods. Notice that some of the URIs include the product ID in path. For example, to get the product whose ID is 28, the client sends a GET request for http://hostname/api/products/28. GET retrieves the representation of the resource at a specified URI. GET should have no side effects on the server. PUT updates a resource at a specified URI. PUT can also be used to create a new resource at a specified URI, if the server allows clients to specify new URIs. For this tutorial, the API will not support creation through PUT. POST creates a new resource. The server assigns the URI for the new object and returns this URI as part of the response message. DELETE deletes a resource at a specified URI. Note: The PUT method replaces the entire product entity. That is, the client is expected to send a complete representation of the updated product. If you want to support partial updates, the PATCH method is preferred. This tutorial does not implement PATCH. 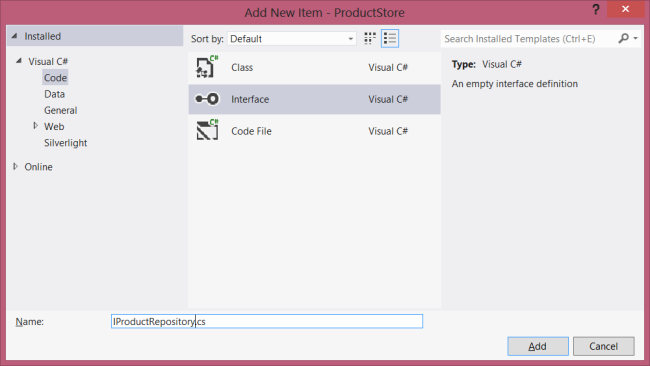 Start by running Visual Studio and select New Project from the Start page. Or, from the File menu, select New and then Project. In the Templates pane, select Installed Templates and expand the Visual C# node. Under Visual C#, select Web. 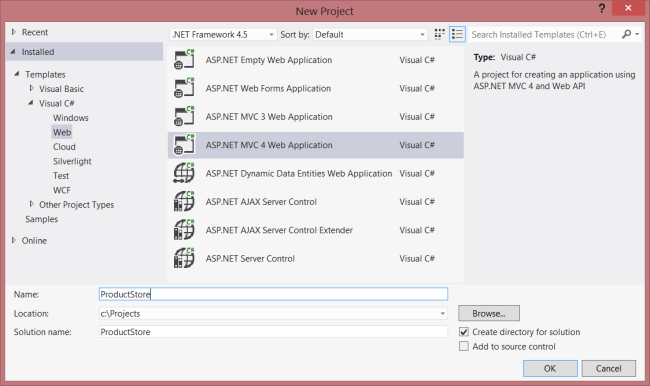 In the list of project templates, select ASP.NET MVC 4 Web Application. Name the project "ProductStore" and click OK.
A model is an object that represents the data in your application. In ASP.NET Web API, you can use strongly typed CLR objects as models, and they will automatically be serialized to XML or JSON for the client. For the ProductStore API, our data consists of products, so we'll create a new class named Product. 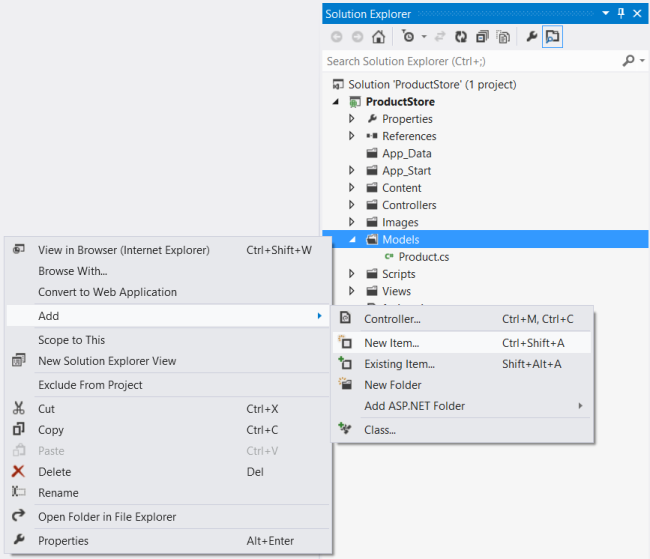 If Solution Explorer is not already visible, click the View menu and select Solution Explorer. In Solution Explorer, right-click the Models folder. From the context menu, select Add, then select Class. Name the class "Product". Add the following properties to the Product class. We need to store a collection of products. It's a good idea to separate the collection from our service implementation. That way, we can change the backing store without rewriting the service class. This type of design is called the repository pattern. Start by defining a generic interface for the repository. In Solution Explorer, right-click the Models folder. Select Add, then select New Item. In the Templates pane, select Installed Templates and expand the C# node. Under C#, select Code. In the list of code templates, select Interface. Name the interface "IProductRepository". The repository keeps the list in local memory. This is OK for a tutorial, but in a real application, you would store the data externally, either a database or in cloud storage. The repository pattern will make it easier to change the implementation later. If you have worked with ASP.NET MVC, then you are already familiar with controllers. In ASP.NET Web API, a controller is a class that handles HTTP requests from the client. The New Project wizard created two controllers for you when it created the project. 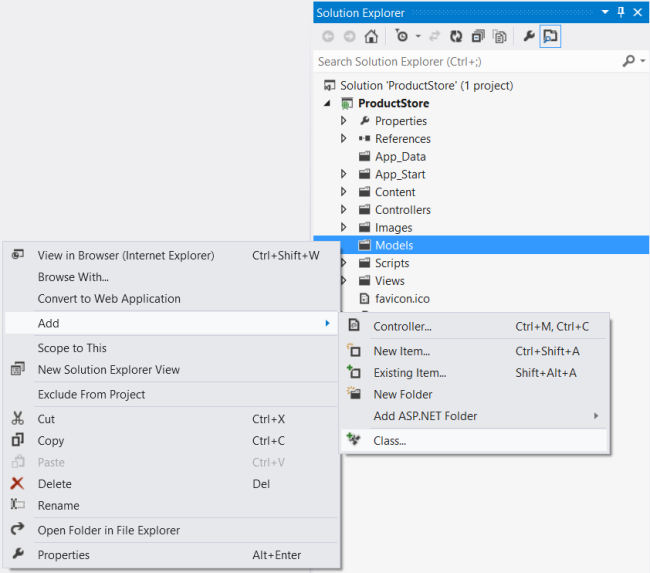 To see them, expand the Controllers folder in Solution Explorer. HomeController is a traditional ASP.NET MVC controller. It is responsible for serving HTML pages for the site, and is not directly related to our web API. ValuesController is an example WebAPI controller. 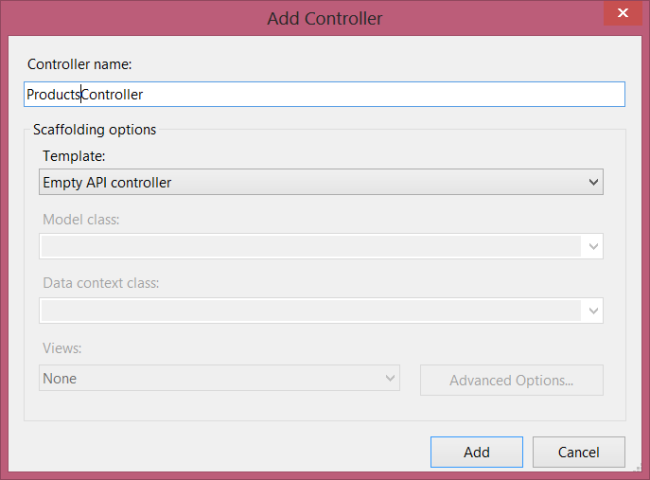 In the Add Controller wizard, name the controller "ProductsController". In the Template drop-down list, select Empty API Controller. Then click Add. It is not necessary to put your controllers into a folder named Controllers. The folder name is not important; it is simply a convenient way to organize your source files. Add a field that holds an IProductRepository instance. Calling new ProductRepository() in the controller is not the best design, because it ties the controller to a particular implementation of IProductRepository. For a better approach, see Using the Web API Dependency Resolver. The ProductStore API will expose several "read" actions as HTTP GET methods. Each action will correspond to a method in the ProductsController class. The method name starts with "Get", so by convention it maps to GET requests. Also, because the method has no parameters, it maps to a URI that does not contain an "id" segment in the path. This method name also starts with "Get", but the method has a parameter named id. This parameter is mapped to the "id" segment of the URI path. The ASP.NET Web API framework automatically converts the ID to the correct data type (int) for the parameter. The GetProduct method throws an exception of type HttpResponseException if id is not valid. This exception will be translated by the framework into a 404 (Not Found) error. If the request URI has a query string, Web API tries to match the query parameters to parameters on the controller method. Therefore, a URI of the form "api/products?category=category" will map to this method. // Not the final implementation! The method name starts with "Post...". To create a new product, the client sends an HTTP POST request. The method takes a parameter of type Product. In Web API, parameters with complex types are deserialized from the request body. Therefore, we expect the client to send a serialized representation of a product object, in either XML or JSON format. Response code: By default, the Web API framework sets the response status code to 200 (OK). But according to the HTTP/1.1 protocol, when a POST request results in the creation of a resource, the server should reply with status 201 (Created). Location: When the server creates a resource, it should include the URI of the new resource in the Location header of the response. Notice that the method return type is now HttpResponseMessage. By returning an HttpResponseMessage instead of a Product, we can control the details of the HTTP response message, including the status code and the Location header. The CreateResponse method creates an HttpResponseMessage and automatically writes a serialized representation of the Product object into the body fo the response message. This example does not validate the Product. For information about model validation, see Model Validation in ASP.NET Web API. The method name starts with "Put...", so Web API matches it to PUT requests. The method takes two parameters, the product ID and the updated product. The id parameter is taken from the URI path, and the product parameter is deserialized from the request body. By default, the ASP.NET Web API framework takes simple parameter types from the route and complex types from the request body. To delete a resource, define a "Delete..." method. If a DELETE request succeeds, it can return status 200 (OK) with an entity-body that describes the status; status 202 (Accepted) if the deletion is still pending; or status 204 (No Content) with no entity body. In this case, the DeleteProduct method has a void return type, so ASP.NET Web API automatically translates this into status code 204 (No Content).